The sea Ice is too heavy for the RRS James Clark Ross to make Rothera base right now. You may have thought the sea ice on the satellite images didn't look too bad, but it's all about how thick the sea ice is, and where the open water is. The sea-ice around the bottom of Adelaide Island has been heavy and whilst (for those of you who look at the satellite pictures) there are some leads and areas of open water, they are close to land and if we took that route (which also includes shallow water and rocks) and the weather then pushed the ice inland, the ship could easily become stuck between a rock and a hard place. And then the ship could get seriously stuck just like I said the John Biscoe did in my previous post. In that case the ship was rescued by Polarstern. The MODIS satellite image off Adelaide Island 25 Nov 2016, with the location of the RRS James Clark Ross 0000 28 November 2016. And this is a navigation chart of that region. 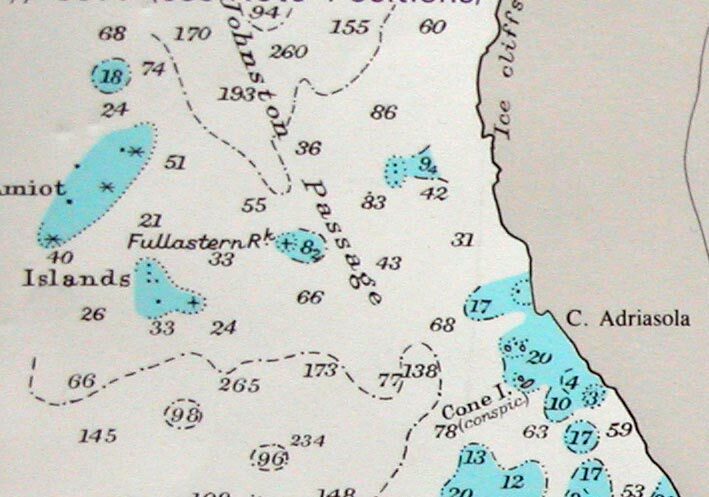 Section of the Navigation Chart around the southern tip of Adelaide Island. The light blue shading is shallow water and it's not a great place for a ship to go without freedom of navigation. The sea ice takes away that freedom. This is of course a very sensible choice by the ships Master, and exactly the same thing happened to a voyage I was on in 2004. In another few weeks it will be clear for them. 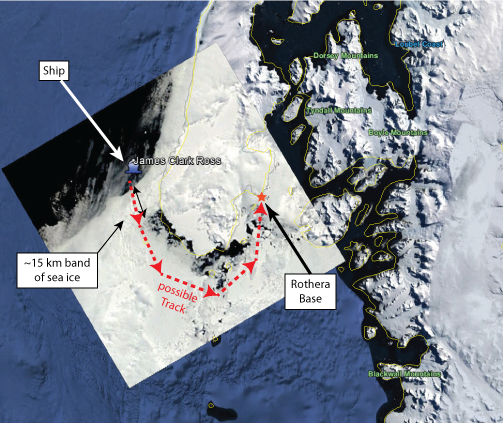 There are a lot of Antarctic research stations on the west of the Antarctic Peninsula, including Rothera, the largest British Base. If the winds maintain the westerly direction then I can imagine it could be slow to resupply the base this season. There is time for it to change. According to the published schedule the ship is not due to arrive until 27 November 2016. A slow resupply is not uncommon and I have been on at least one unsuccessful resupply voyage in my career. I took the picture below on 11 December 2004 under similar conditions. 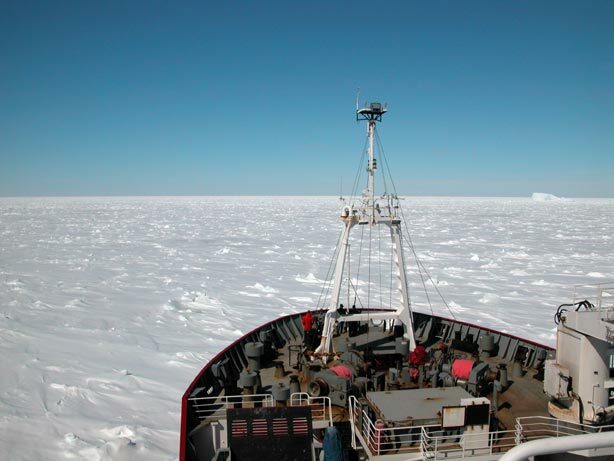 James Clark Ross making very slow progress in compressed sea ice in Marguerite Bay, the Western Antarctic Peninsula. Although it is not predictable, the fantastic British Antarctic Survey Operations will have planned for the consequences. 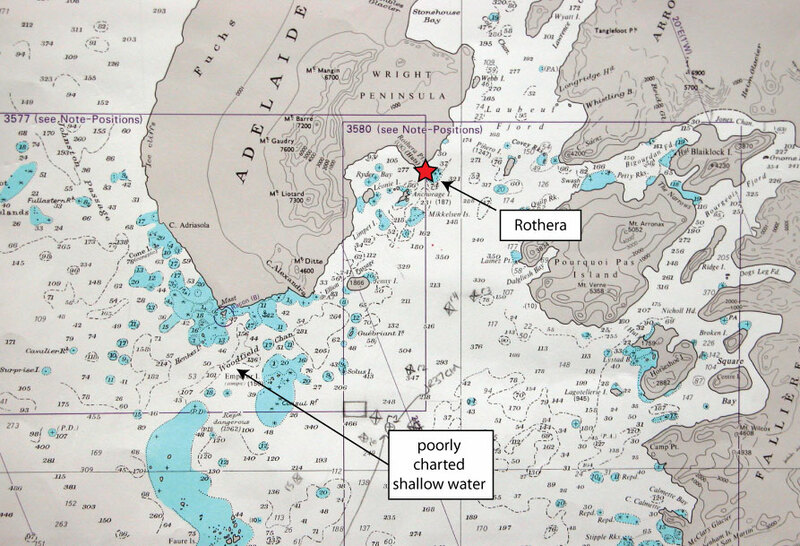 Fullastern Rock (67° 36′ 58″ S, 69° 25′ 59″ W) is a submerged rock on the west side of Johnston Passage, to the west of Adelaide Island. It was first charted by a Royal Navy Hydrographic Survey Unit from RRS John Biscoe in 1963. The ship was compelled to go full astern to avoid this hazard – a story succinctly captured by this evocative name! Posted in Science. Tags: Adelaide Island, Antarctic, Fullastern Rock, James Clark Ross, Rothera, sea ice on November 29, 2016 by Mark Brandon.